Online communication is a big part of our personal and professional lives. We often discuss important topics in web meetings and video chats, and it is only natural that some of us want to record videos of these conversations. Adobe Connect is a Flash-based software designed for the production of presentations, eLearning content and web conferencing. The software has become very popular within the corporate culture because it provides a simple and efficient way to hold online meetings and record them at the same time. In case you were wondering how you can record videos in Adobe Connect, you've come to the right place because in this article we are going to take you through each step of the process. How to Record Videos in Adobe Connect With the Built-in Recorder? Even though you can use the speakers on your computer or an external microphone to record the audio, it is advisable to enable the Universal Voice option in order to make sure that the sound you record with the video is natural and clear. If you still haven't installed the Adobe Connect on your computer, you can do so by clicking here. Once you've made sure that your microphone works properly, launch the software and head over to the Meeting menu, then select the Record Meeting option. The Record Meeting dialog box will appear on the screen, and you should add a title and a short description of the meeting. The audio recording option may be disabled by default, so if you want to record audio while capturing the video, simply click on the Turn on Audio Conference feature. Click on the Record Meeting button to commence the video recording session. You can pause the recording or click on the Stop button if the web conference is over. After the video recording session, you'll be able to change the URL's title, and if you would like to edit the video directly from the Adobe Connect you can do so by clicking on the Edit Video button. Editing videos in Adobe Connect will require you to have the Host permission, but if you are the author of the video you'll be granted the permission automatically. The link you've created by recording the web conference or a training doesn't change if you edit a video, which means that you can edit a single video in Adobe Connect as many times as you want. When the video recording session is over, you should click on the Meeting or Training option on the software's homepage. Proceed to select the classroom or the meeting that contains the video you just recorded. 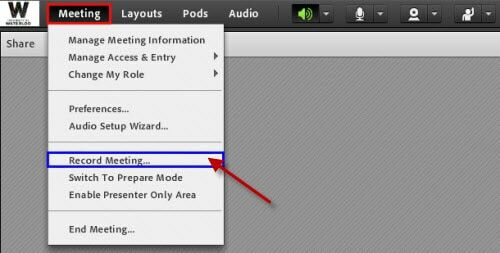 Afterward, you should click on the Recordings option, and then select the Edit Recording feature in the Actions pop-up menu. The software's video editor will appear on the screen, and you'll be able to see the toolbar that enables you to play the video or cut the unwanted parts of the file. Click on the Play button to preview the video or use the progress marker to jump to a desired spot in the video. You can also use the progress marker to designate the place in the video where you want to make a cut, and then simply click on the Cut icon that looks like a pair of scissors. The Adobe Connect's video editor also enables you to control the volume level by clicking on the audio icon on the right side of the editor's toolbar. If you make a mistake during the video editing process, you can use the Undo button to correct it. When you remove all the unwanted parts of the video, click on the Save button to conclude the video editing session. Adobe Connect is one of the best software products for the creation of eLearning content and video presentations currently available on the market. Its recording and video editing features are powerful enough to enable the software's users to capture high-quality footage of web conferences and online training, but Adobe Connect lacks advanced features high-end professionals use to create their content. Best Elgato Capture Card: Which one should you Choose?